Sacramento pikeminnow in the Yuba River. Photo by Josh Viers. California has long been home to a rich array of native freshwater fish, including some species found nowhere else in the world. There is the Paiute sculpin that favors cold waters moving over the shallow gravel of a mountain streambed, the voraciously predatory Sacramento pikeminnow that can be found in deep river pools, and the tidewater goby that prefers the brackish waters of estuaries. Of course, there are also well-known fish such as salmon and steelhead trout that migrate every year from the Pacific Ocean to the state's coastal rivers. Paiute sculpin. Photo by Jacob Katz. Steelhead trout. Photo by Ted Grantham. Protecting this bounty has been a challenge. Many native fish populations have been in rapid decline since at least the 1970's when UC Davis scientist Peter Moyle began tracking them. The decline is due in part to the limited protections available for native fish. There is the Endangered Species Act, which focuses on individual species that are already threatened with extinction. And there are protected areas which, in theory, cover multiple species and their habitats. However, most of these areas were chosen for their scenic beauty and limited development potential, not necessarily for the species that live there. Given this conservation dilemma, a research team led by Ted Grantham, a cooperative extension specialist at UC Berkeley, analyzed where the biggest gaps in native fish protection are across the state. The group first determined which watersheds contribute the most to native fish diversity. They then compared those locations to those of existing protected areas. In short, the research team found that the rivers and streams that contribute most to California's native fish diversity remain largely unprotected. This was somewhat expected given previous research, but Grantham says they were still surprised by the degree of mismatch between protected watersheds and those important to native fishes. Scientists have identified high priority areas for native fish conservation across the state. Currently protected areas (in grey) do not necessarily match up with areas important to native fish. For example, most of California's protected areas are found in the Sierra-Nevada mountain range and the state's desert ecosystems. While that has helped species like the desert pupfish that live in small desert springs and golden trout, the official state fish and resident of high mountain streams, most native fish reside outside protected areas. 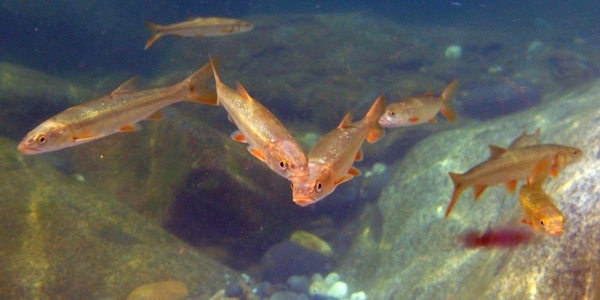 Indeed, native fish are found all over the state, and particularly along the coasts and lower reaches of large rivers including the lower Klamath, Russian, Salinas rivers, as well as the Sacramento River and Delta, where fewer protected areas are located and extensive human development has occurred. Grantham notes that there are also several important and largely unprotected interior watersheds that support endemic fish fauna. For instance, in northern California, Goose, Eagle, and Clear lakes are all home to fish found only in California. The Sacramento-San Joaquin Delta is one area researchers identified as a priority for native fish conservation. Photo by Faith Kearns. Completing this kind of statewide analysis was made possible by a large team effort that included researchers at UC Davis, Trout Unlimited, and The Nature Conservancy (TNC). The study also builds on more than 30-years of knowledge of California's native fish gained through research by Peter Moyle and others. 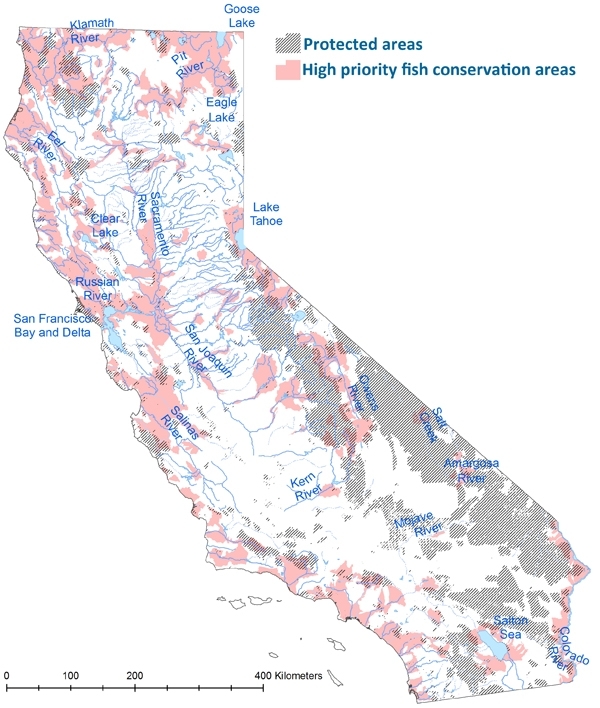 Information on where fish occur in the state was recently made available in a database known as PISCES, which contains over 300,000 records of expert-verified fish observations compiled from multiple sources and describing the historic and current ranges for all of California's native fish, as well as numerous non-native fish. Grantham says the team's findings mean most native fishes will require active management outside of protected areas. He hopes the research will provides the foundation for a statewide plan to guide conservation and management of the state's native freshwater biodiversity in an efficient and cost-effective manner. The full study results are in: Grantham, T., K. Fesenmyer, R. Peek, E. Holmes, A. Bell, R. Quiñones, N. Santos, J. Howard, J. Viers, and P. Moyle. 2016. Missing the boat on freshwater fish conservation in California. Conservation Letters DOI: 10.1111/conl.12249.